Wright State University Theatre wraps up its 2018–19 season with the captivating love story “A Little Night Music” from March 21 to April 7 in the Festival Playhouse in the Creative Arts Center. Performances are March 21, 27, 28 and April 4 at 7 p.m.; March 22, 23, 29, 30 and April 5 and 6 at 8 p.m.; and March 24, 30, 31 and April 6 and 7 at 2 p.m.
Tickets are $25 for adults, $23 for seniors and $15 for students. Tickets are on sale through the Box Office at 937-775-2500 or online. With music and lyrics by Stephen Sondheim and book by Hugh Wheeler, “A Little Night Music” is based on the Ingmar Bergman film “Smiles of a Summer Night.” The musical originally opened on Broadway in February 1973 played through August 1974. It won the New York Drama Critics’ Circle Award and the Tony Award for Best Musical. It has since been produced professionally in the West End, by opera companies and in a 2009 Broadway revival. Set in 1900 in Sweden, “A Little Night Music” follows a tangled love triangle between actress Desirée Armfeldt, lawyer Frederik Egerman and the debonair Count Carl-Magnus Malcom. Also caught up in the web of romance are Fredrik’s son, Henrik; Fredrik’s wife, Anne Egerman; the count’s wife, Countess Charlotte; Anne’s maidservant Petra; and Desirée’s manservant, Frid. The story begins to unfold during “A Weekend in the Country” at the mansion of Desiree’s mother, Madame Armfeldt. In the Wright State production, Desirée will be portrayed by Celia Arthur, with Kenneth Erard (Fredrik), Aaron Roitman (Henrik), Ross Bloedorn (Count Carl-Magnus), Isabella Andrews (Countess Charlotte), Rachel Glynn (Anne Egerman), Heather Cooperman (Madame Armfeldt), Michaella Waikman (Fredrika), Hailey Noll (Petra), Jeremy Farley (Frid), Robin Dunavant (Mrs. Anderssen), Kayli Modell (Mrs. Nordstrom), Emma Buchanan (Mrs. Segstrom), David Emery (Mr. Erlanson), Jonathan Crawford (Mr. Lindquist), Molly Seybert (Malla), Justin Mathews (Bertland), Savannah Slaby (Osa) and Bridget Lorenz (Swing/Liebeslieder Cover). “A Little Night Music” is directed by Greg Hellems (“The Mystery of Edwin Drood,” “9 to 5: The Musical”), with musical direction by the late Scot Woolley and Steven Hinnencamp. Sets are designed by Pam Lavarnway, lighting by Matthew Benjamin and Emily Hope, costumes by Courtney Zimmerman and sound by James Dunlap. 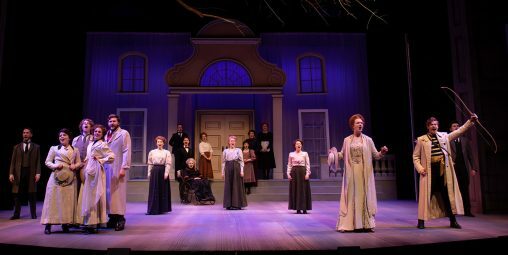 The production is dedicated to Woolley, who served as musical director of the Wright State Theatre Program for more than a two dozen memorable productions, including “Les Misérables,” “9 to 5,” “Chicago” and “Crazy for You.” Woolley, who died unexpectedly in January, touched the lives of countless students, staff, faculty and patrons with his inimitable talent and boundless joy.